The 1970s Diet: Republican tendencies or Jubilee Jubilation? That's me on the left with my straw boater hat! What do you think? I'll let you decide as I can't. So the bunting is out, the union flags are a flapping and the nation appears to be in a joyous jubilation mood. There has been many a street party, "proud to be British" "love the Queen" type comments doing the rounds on facebook and twitter. 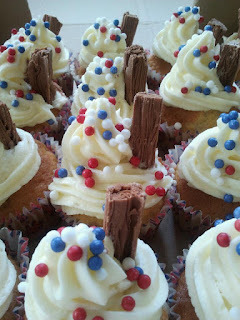 Not to mention various home made cupcakes all with a Jubilee theme. The children's school had a whole day of celebrations on Friday. They didn't dress up but had a picnic on the field, games (including wellie boot throwing) and face painting to name but a few. The finale was the children singing a London Medley which was very sweet. The PTA capitalised on the occasion by having a very manic but successful cake sale. My children had a great time and came home with their home made crowns and flags. To my husbands horror, our daughter started doing a rendition of God Save the Queen after tea. 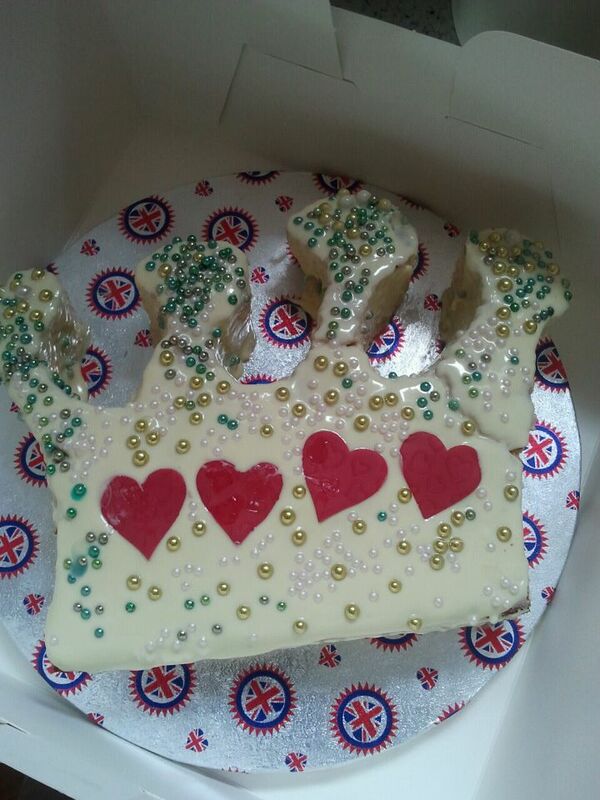 As a family we went to a fabulous party yesterday thrown by our friends - right royalists and Beatle lovers so they are. The food on display was amazing. Everyone brought along something scrummy. I was going to put my own pics on but some other bloggers at the party have done a far superior job of it. Check out their pictures - Fashion Detective (you might want to vote for Jo in the Mad Blogs if only for the fact she doesn't have mummy in the title) and this gorgeous photography blog. My '99 flake cupcakes got a look in too. I thank you. I am patriotic. I like this country. I think the union flag it is an outstanding design recognised the world over. I would go so far as to say it is iconic. You'd pay good money to come up with an image like that for a brand. I am not, however, a Royalist. I probably was at some point. My nan was born and bred in Windsor and my great grandfather was a chef at Windsor castle. My nan had various royal memorabilia and I was bequeathed her Kings and Queens book collection when she passed. There is a picture of me with my sisters in 1977 merrily waving the union flag and I vaguely remember a street party and fancy dress competition. The same thing happened in 1981 for Charles and Diana's wedding. I loved watching all the pomp, ceremony and wedding dresses. I also watched William and Kate's wedding from start to finish "just to see the dress" whilst the husband contemplated taking his own life. I let my daughter decorate this - it killed me! 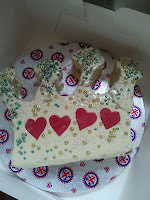 Some may say its my husbands staunch Republican views that have made me less than pro royal but I would beg to differ. I remember sitting on the train in 1997, on my way to work, flicking through the newspaper and seeing Princess Diana yet again papped in the paper. I was so sick of it. I didn't wish the fate that was bestowed upon her but I had no fascination whatsoever. You can't really have a discussion in our so called 'democratic' society about the possibility of a republic. Any coverage of this in the papers is derided. The British love the monarchy so says the Daily Mail and everyone else. End of. Its not open for discussion. There is no need for a discussion that these people believe they have a divine right to rule, their ancestors stole land and brutalised other countries so they could live in big castles. In an age of austerity we are happily waving flags at a woman and her family who have more than anyone could ever need. The Crown Jewell's alone are worth billions. Our Queen has the worlds biggest diamonds in her collection which were looted from Africa in the name of Empire. We like to take things you see. That kind of wealth could do so much good in the world. There are people starving and we still have Queens? Surely god wouldn't approve would he? Would he approve that 5% of this country's population own 95% of the land rights? Questions to be answered me thinks. Queen Victoria was quite happy whilst her people - we are still the queen's 'subjects' how thoroughly modern - were starving. There was mass poverty in this country during her reign. The French didn't take kindly to this carry on in their country. Us Brits didn't mind and still don't. Most say "oh its good for tourism" "its good for the economy". What that economy that owes trillions and is in a double dip recession. How's that working out for us. I mean she doesn't let the tourists come in for a cuppa when they're over. I'm pretty sure people would still show up to London for our sights alone. They do realise they are unlikely to come across the Queen on their travels. Besides if you stopped paying the millions, sold a few trinkets this would far outweigh any tourist income. Last night I watched some of the Jubilee concert and had to have a bit of a chuckle. There was the leftie that was - Annie Lennox giving it some not to mention Sir Paul McCartney. The same Sir Paul who handed back his MBE in the sixties when he had a social conscience. What would John make of it all I wondered. Then you had Stevie Wonder changing his lyrics for our warrior Queen - Boadicea she ain't. Here was a black man singing to someone who's ancestors made his ancestors slaves. Maybe Grace Jones sang 'Slave to the Rhythym' for another reason other than to have a hula hoop going around her waist for the duration of the song. The concert was hailed as a success. The Queen was clapped and cheered at doing such a wonderful 'job' of attending functions and wearing frocks for 60 years. When it was over the spectators retreated back to their humble homes feeling grateful that they had been able to witness such an event. But bygones should be bygones. Let us not delve too deep shall we. That would be just too much because if you really think about it - the notion of a monarchy and what it stands for is a nonsense. I don't think you can argue with that. Its on a par with today's celebrities but these are bona fida celebrities because its historic. So forget what I've just said. Its all good fun, it brings us all together, we like looking at the pretty frocks and we don't mind this family having everything when millions don't. And aren't I just the hypocrite making Royal chocolate covered cakes, dressing up in union inspired numbers and attending Jubilee celebrations. So am I a Republican, a spoil sport or a secret Royalist in disguise? I'll let you decide because I surely can't! Best post on the jubilee I have seen so far. Awesome- Thank you for the link and I have to say I agree completely. I never thought about the monarchy until I read a piece by Edmund Burke (http://en.wikipedia.org/wiki/Edmund_Burke) when I was studying history at uni. He stated that hereditary right is ridiculous, how can you say that someone's son will be a good king just because they were? I think that your post has addressed the White Elephant in the room of the entire UK right now- well done you! I loved this post..I was like you five days ago.